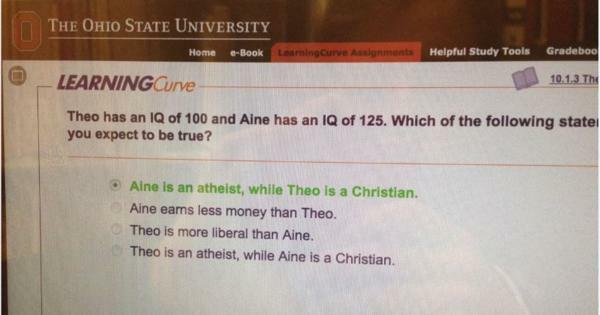 The Ohio State Psyco 1100 test which correlated higher IQs to atheists over Christians went viral across the Internet, especially on conservative sites. Now the university has responded, pushing the blame on the text book publisher, Worth Publishing. Richard Petty, chairman of the Psychology Department at Ohio State University, says this wasn’t a quiz they published. “Nobody in our department, no faculty, staff, students – anybody had anything to do with this,” he said. Petty blames a text book publisher, Worth Publishing, that offers online sample quizzes as a supplement for students. “I’m pleased the publisher took swift action, acknowledged it was a mistake and it doesn’t reflect the content of the course or the book or anything like that,” he said. While he hasn’t found out who wrote the question, Petty says they clearly are inexperienced and don’t have a good knowledge of the field. The publisher of the quiz released a statement to WTVN.